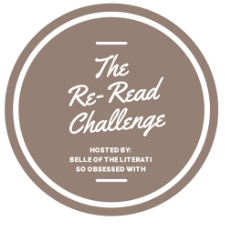 Hannah @ So Obsessed With and Kelly @ Belle of the Literati are hosting a new, fun challenge for bloggers in 2015: The Re-Read Challenge! 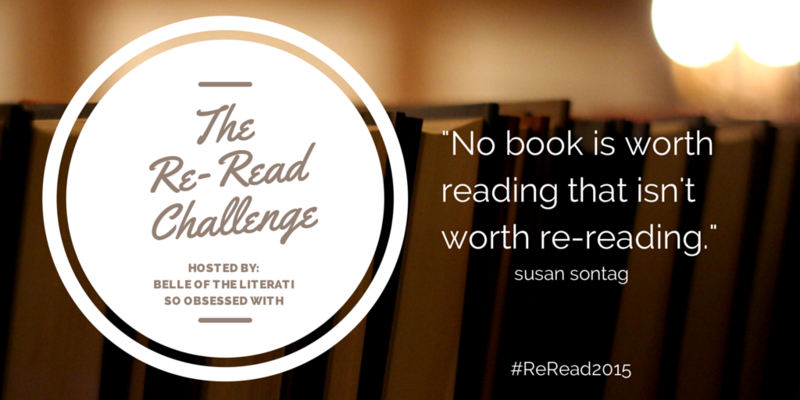 Not much of a “challenge,” per se, because why wouldn’t you want to re-read and re-experience some of your favorites? I’ll be honest, I’m really looking for a small break from my typical rush to blog and review. Interested in participating? Sign up before the end of January, commit to the challenge, and in your re-read review, be sure to answer these questions. Add your post to the monthly recap post on Hannah or Kelly’s blogs, and you’ll be entered for giveaways! Check out what other bloggers are re-reading, too. You might come across some other bloggers re-reading the same books as you! …sit back and relive the Hogwarts experience (gotta catch up with Pottermore and reread Goblet of Fire (1) and Order of the Phoenix (2) (which will be terrible because I haven’t reread OotP since the day it came out. There’s a dent in my bedroom wall from where I threw the book. You know what brought that on. Don’t even ask). …fall into the magic of The Night Circus (3). …sob my eyes out over The Fault in Our Stars (4). …giggle with Anna in Anna and the French Kiss (5). …seek independence with Jane Eyre (6). …dive into the suspense of The Likeness (7). …agree completely with Emma in One Day (8). …completely understand Cath on every level in Fangirl (9). …remember why Kate Morton rocks my world in The House at Riverton (10). Aren’t those books divine? You should sign up! This sounds like a great idea! Would it count if I re-read books I’m teaching next semester? I’m sure it would! Go check out Hannah’s rules! Harry Potter… I am debating on whether or not I want to put that on my list. And I think we all know why that dent is there. No one likes that book, let’s be honest, and for many good reasons! We love it in the way you love a spouse, partner, friend, etc, but you don’t “like” them at that moment because they made you mad. That’s how I feel about that book, at least. However, TFiOS. I should probably add that to my list. It’s been awhile. Ha I think I scribbled through most of that book and marked the mess out of it because it was so great. So maybe this is a good excuse to buy a new copy. I’d quite like to re-read Fangirl now that I have a physical copy! I found the fanfiction a little intrusive in the eBook. I can see how that would happen. Just a simple page turn in the physical copy and you’re set.